Making Things Work: Tales From a Cabinetmaker's Life - NR HILLER DESIGN, INC. Please note: Rated “S” for sailor language. Hardbound book, 141 pages, printed and bound in the United States. Fashion statement. Celebrity sport. Path to personal salvation. Furniture making, once a way to earn a living through an arrangement between makers and clients, has been discovered, like a rosy-cheeked girl plucked from a Nebraska farm and made over into a big-city model. For many of us, making furniture and cabinetry is still a way to earn a living, however marginal. We may do what we love every day, to paraphrase the marketing pitch of a well-known school, but as with most long-term love, ours deepens from the passion of new romance to the mature familiarity of marriage: sometimes tedious, occasionally exasperating, as much taskmaster as muse. The day-to-day realities of those who make things for a living get scant attention compared to the potential satisfactions of craft as avocation. But they are every bit as important – especially for those actively considering exchanging the lecture hall, office, or operating room for a woodworking shop. Honest, earthy, and wryly humorous, this collection of tales drawn from more than 30 years of experience at shops in England and the United States is thought provoking as well as entertaining. We follow Hiller as she stumbles into furniture making after dropping out of Cambridge University, finds employment in one, then another, English workshop, grapples with monotony, sexism, and self-doubt, attempts escape, and eventually makes peace with her vocation. Shipping: Shipping is via US Postal Service Media Mail, which may take up to 2 weeks. For expedited shipping, please contact NR Hiller via the NR Hiller Design website “contact” page. Returns: Returns will be accepted provided that the product is in brand new condition and received in its original packing within 30 days of shipment from our premises. Nancy Hiller’s chisel-sharp, damn-funny memoir reveals that even when someone knows how to put things together to stay – and does an equally elegant job assembling sentences and cabinets – life itself is rarely susceptible to such resolution. Her book is an engaging ramble, the unsparing story of a perceptive woman deeply dedicated to her craft but noting at each turn that her path through it is provisional. For those of you who have ever dreamed of becoming a professional cabinetmaker, or for those professionals who have the scars to prove it, or for anyone who just enjoys an accurate look into a life spent honing a craft, you really need to get this book. 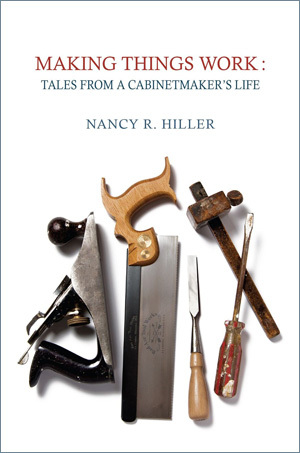 A nationally renowned woodworker, author, and teacher, Nancy Hiller has written a fascinating account of some of her trials and tribulations that compose the nearly Sisyphean task of making a living by doing that which she loves. The stories she tells are funny and sharp, occasionally pathetic, often brave, and most of all, inspirational. Make a space on your bookshelf for this one. A cabinet-maker’s Bildungsroman, Nancy Hiller’s story charts a path fraught with adventures both good and bad, savors the victories, and rises above the adversities with an indomitable, creative spirit that brings joy into homes forever imbued with the craft her hands wring into form and beauty. A must-read for those brave souls ready to sally forth into a creative profession where belief in oneself must never waver. This is not a book merely about making cabinets or dressers or chairs. It is about the forging of a principled life. Nancy Hiller introduces us to the everyday struggles and big philosophical questions that define what a craftsperson is and how she may survive in our mass-produced world. This book is riveting, pulling the reader into the author’s transatlantic story, including unrequited romances, conflicts about hinges, occasional slapstick, and sleepless nights spent worrying about budget, hardware, and design. Read this book to see how we can make our way, one dovetail joint at a time. These poignant, honest, sometimes heartbreaking and sometimes hilarious but always masterful stories are so much more than woodworking anecdotes – they are nakedly human moments…. A necessary read for any aspiring craftsperson, but just as requisite for the clientele. I can’t decide in what retail section this book should be displayed – fine woodworking? Sure, that’s easy, but the integrity of Ms. Hiller’s voice, the tenacity of her principles, and the respect with which she endows honest, hard work compel me to suggest instead the shelves of philosophy, self-help, etiquette, or even religion, goddamnit. “I hope this isn’t too gushing. I’ve never read a book like this before. I’m fairly sure that no one has ever written a book like this before! Combining the nitty gritty of commercial woodwork with humour and a sense of adventure is an impressive feat. It would have been very easy to let it become either negative and whiney or a sort of Krenovian musing on the profundity of craftsmanship. The structure did a lot to make it enthralling and allow you to explore different ideas. You must have spent a lot of time grappling with the order of chapters, what to reveal when and how to open and close the narrative. “Guilty! I read the whole book last night. I intended just to read a chapter or two, I could not put it down. I actually put aside Ian McEwan, one of the best writers around (in my opinion)… [F]ascinating and interesting and funny and very informative. I loved it.